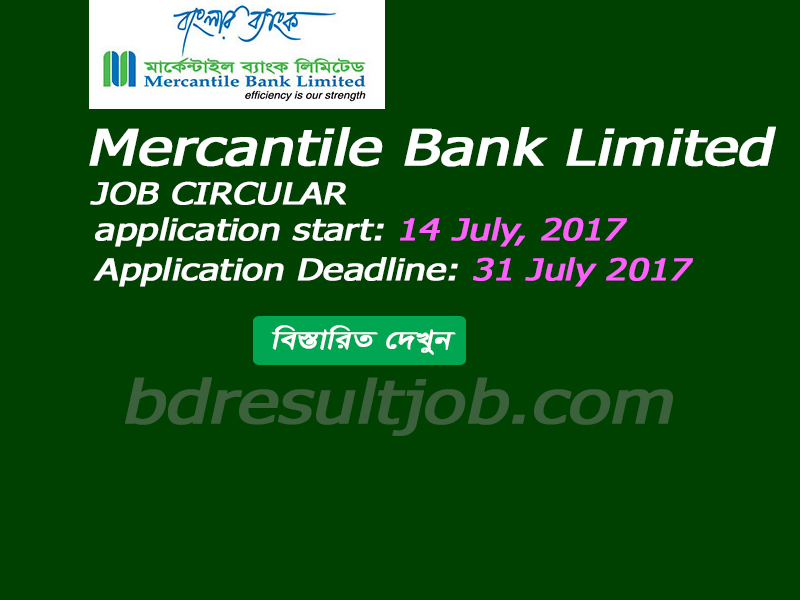 Mercantile Bank Limited job circular 2017 has been published for vacant position of ANAGEMENT TRAINEE OFFICER (MTO). Mercantile Bank Limited is most popular private Commercial Bank in Bangladesh. If you Eligible candidate can apply for the position this job, you should submit your application within 31 July 2017.
a. Post graduate/4 years integrated honors degree in any discipline, preferably in Economics/Banking and Finance/Management/Accounting/Marketing/HRM/Mathematics/Statics/English/Engineering/ computer Science/ MBM/MBA/ BBA from any reputed public/private universities of Bangladesh and abroad. Chartered Accountants/Cost & Management Accountants may apply for the position. b. Minimum 3 (Three) 1st classes/Divisions or equivalent CGPA, with no 3rd Class/Division or equivalent CGPA in any examination. a. CGPA 3.00 + & CGPA 4.00+: 1st class in the scale of 4.00 & 5.00 respectively. a. Good knowledge in latest operating systems. 5. Salary Range: Minimum gross salary BDT 40,000.00 1 (one) year probationary period. Successful management trainee officers will be absorbed in the regular cadre according to the bank policy. 6. Surety: Selected candidate appointment shall be required 4 (four) years surety bond from the date of joining. Interested candidate who confident to fulfill aforesaid criteria apply online. 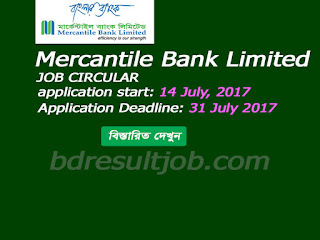 You are here from: Mercantile Bank Job Circular 2017, www.mblbd.com, Bank Job 2017, Career at Mercantile Bank Ltd, Job Circular Mercantile Bank Limited, MBL Job Opportunity, mblbd.com, Mercantile Bank Job Circular, Mercantile Bank Limited Career 2016, Mercantile Bank Limited Career 2017, Mercantile Bank Limited Job Circular, Mercantile Bank Limited Job Circular 2017.